If you happen to live in Minnesota, and pay attention at all to local food media, you’ve probably heard mention of Pizzeria Lola. Every food blogger worth their salt has already been there, snapped photos and gushed about the Sunnyside [here, here and here]. I know, I know–this place has been around for a couple of years. It’s been said! It’s been done! But I consider myself to be a passionate participant in the local food scene so I have to grab a few eager eaters from my circle and harness the energy to drive 20 minutes to check it out, snap a few pictures with my mobile phone, [no flash of course! I don’t want to ruin the night for others] so that I can add my two cents to the dialogue about this hip, wood fired neighborhood pizza joint. 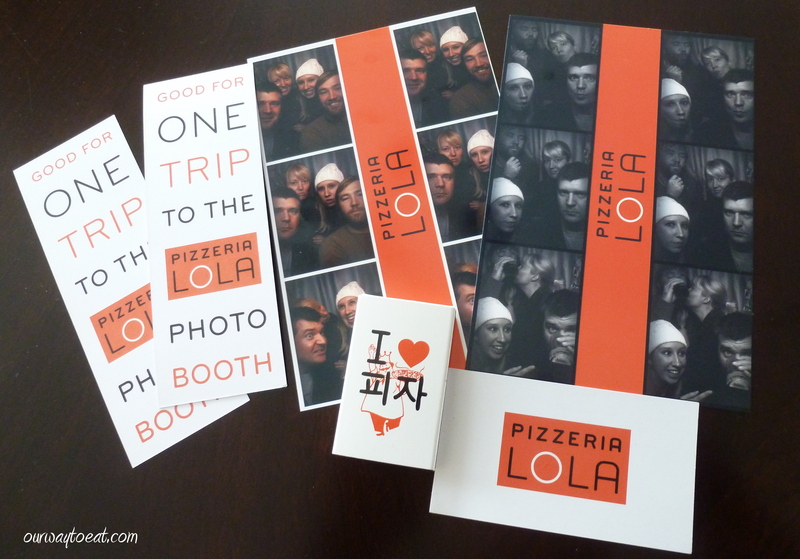 Without further adieu, our first trip to Pizzeria Lola. As I alluded above, every blog entry that I have found dives right into gushing about that Sunnyside pizza. From me, this will come later. For me, the first trip to Lola started with swag. I love fun restaurant swag. I don’t expect it, but when a restaurant sets out a fridge magnet, an interesting business card, a poster or a book of matches for their patrons, I’ll take it and save it to make a collage. We walked in the door and I helped myself to a business card and a box of wooden matches, which have been useful for lighting candles and a fire in the fireplace, thank you very much. All of the tables were full, and we were told there would be a wait. My brother-in-law bought a round of beers and I purchased a couple of trips to the photo booth. I love photo booth snaps. I consider a photo booth to be a medium for producing spontaneous and lighthearted art. We were supposed to leave our contact info on the back to the photo booth passes, and a few pictures on the wall, but there were already an entire wall full of very nice photo booth pictures so we, as a group decided it would be better to keep all of the above photos for ourselves so we could all have some. Somehow I still have all of them. Oops. As usual, the wait wasn’t bad. I am always optimistic about restaurant wait times, though I do appreciate when a host makes a worst-case-scenario prediction about the anticipated wait time. It never fails to give me a lift when I wait for 20 instead of 40 minutes. 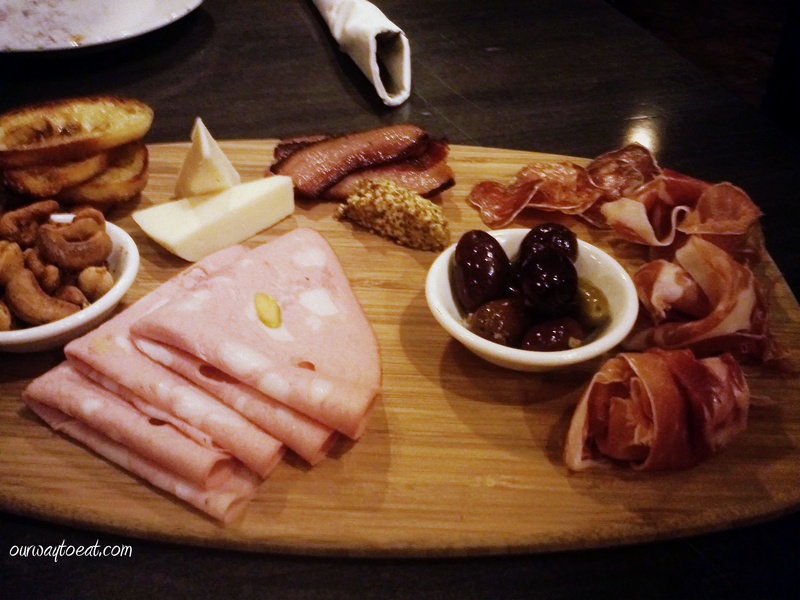 When we were seated, we started by sharing the Lola Antipasto Platter. It came on a large bamboo cutting board and contained house made bacon from Hidden Streams Farm, grainy Dijon mustard, a few slices of natural casing pepperoni, La Quercia Prosciutto twisted into rolls, a dish of mixed olives, some kind of olive-loaf-type bologna thing,* a dish of cashews, slices of toasted bread and a few wedges of a creamy cheese. ** This was an ample appetizer for four of us to share, and even though I didn’t eat the meat, I thought the antipasto platter was great. 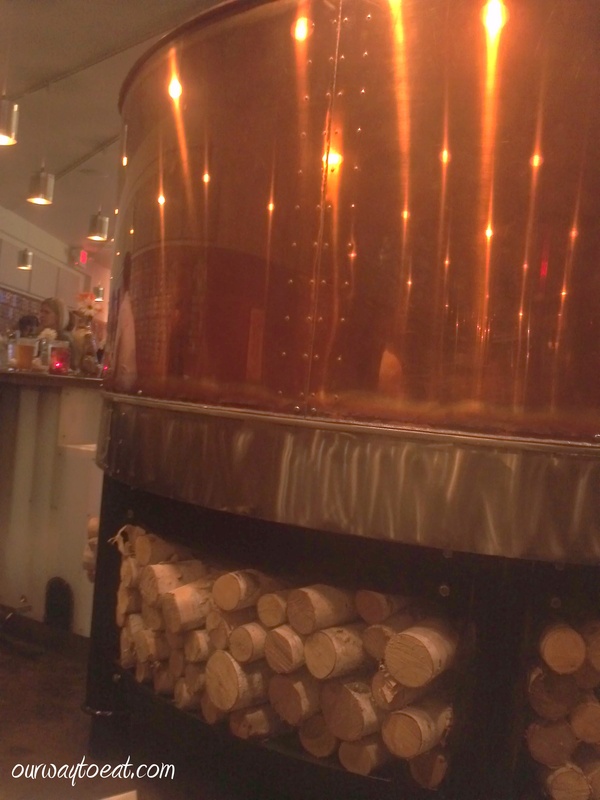 It was probably my favorite part of the meal, along with the Surly Furious. I enjoyed the intersection of Korean and Scandinavian touches throughout the restaurant. I don’t know of any other restaurant that thoroughly references these two cultures in its decor. 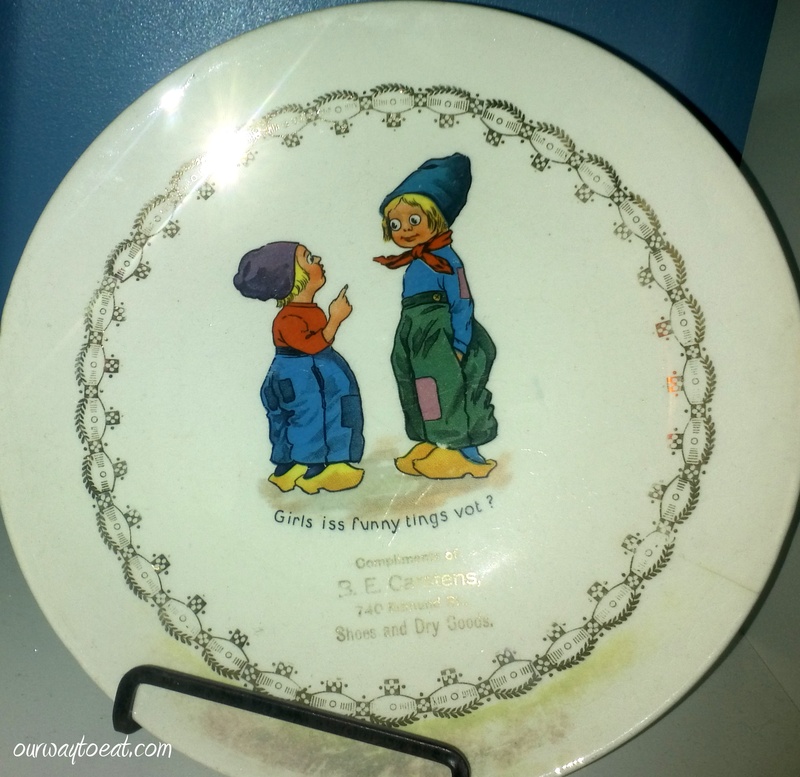 This is a plate that is perched in the ladies room. Girls iss funny tings vot? I agree. Girls are funny. We ordered our pizzas, and then the server brought plates for us to eat from. 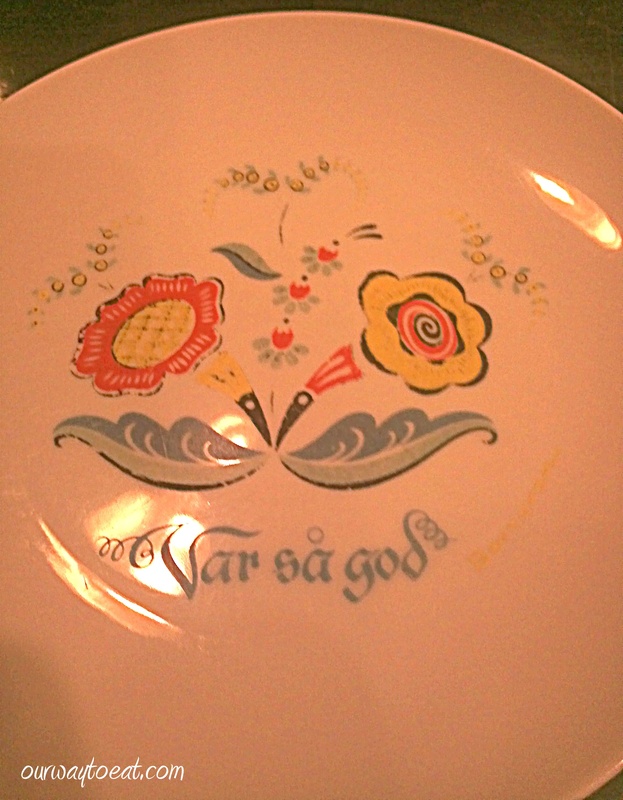 Mine is pictured just above reads Var så god. When I was little, after my family finished eating a Sunday roast beef dinner, my Grammie, who moved to Norway to marry my Grandfather taught me to circle the table and curtsy, and clasp hands with the hosts [my parents] and say “Takk for Maten!” which translates to “Thank you for the food!” Each person would reply Var så god! which translates to “There you go!” but means “You’re Welcome.” Pizzeria Lola, you may not be my new favorite pizzeria of all time, but you had my heart at Var så god! I see on the website that posters by Aesthetic Apparatus are for sale. I am not sure if Aesthetic Apparatus made these fun I Heart 피차 design that appears on the matchbooks and posters and throughout the restaurant. I have several band posters by Aesthetic Apparatus in my collection, and I Heart Pizza too. I am going to be honest and say that I am not going to rave about the pizza I ate at Pizzeria Lola. That isn’t the pizza’s fault. I wanted a pizza with mushrooms on it, so that is what I had, a Pizza Margherita, which comes with Italian red sauce, fior di latte, olive oil and fresh basil with the addition of sautéed oyster and cremini mushrooms, which is available on all pizzas for $2. I get it, foodies. When I go to a place that uses good ingredients, and creates things artisanally, I should order dishes from the menu as they are envisioned by their creators. But a plain pizza with no veggies doesn’t do it for me and, tonight I just didn’t feel like a Forager, a mushroom pizza without sauce. I have a penchant for controlling the things I eat, and I’m pretty much obsessed with mushrooms. I won’t apologize for customizing my pie. I know that even though it was not my favorite pizza of all time, it was good. My cousin and brother-in-law both tried out one of the night’s specials. Above is Alice’s pizza. It was described as Russian. It contained slices of sausage and red and green peppers. I think Alice liked it, but maybe liked my pizza a little bit more. She is also a fan of mushrooms. 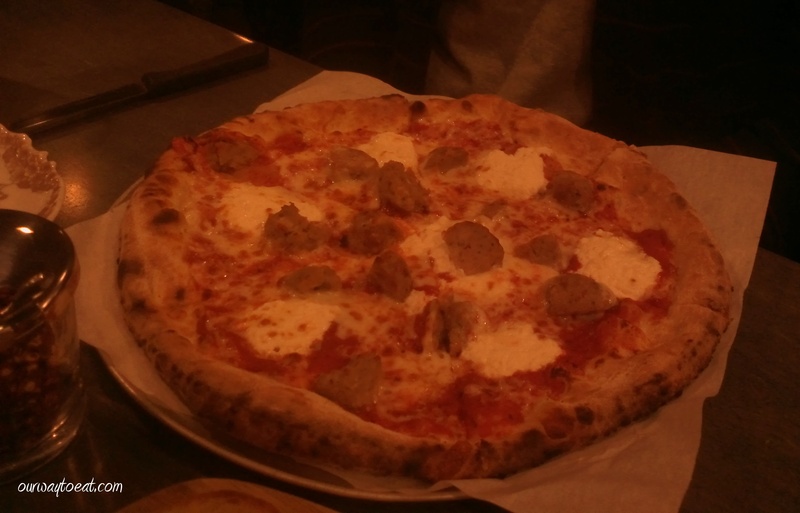 Brett’s pizza was also a special that evening, and it contained some kind of meatballs that look a lot like crumbled fennel sausage to me. 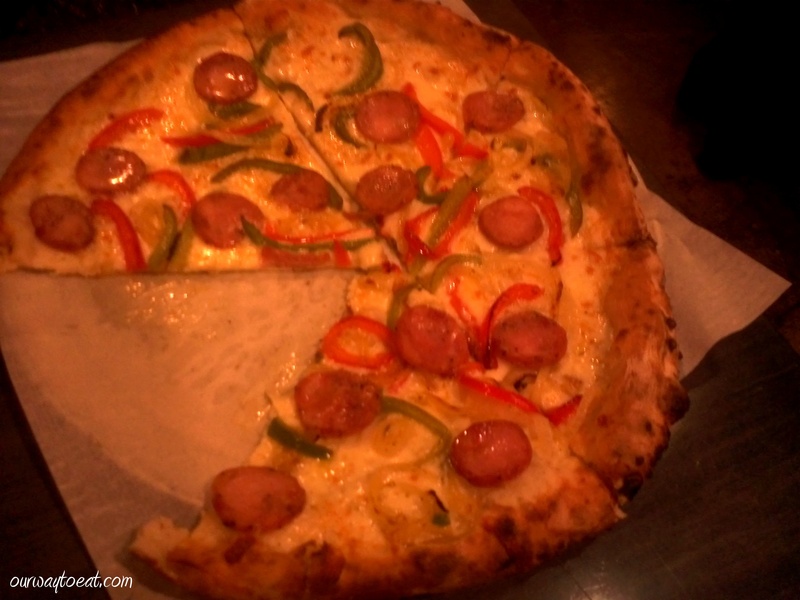 He has been to Lola before and sampled the Lady Za-Za, a pizza topped with House-made Korean sausage with kimchi, serrano peppers, soy chili glaze, scallions and sesame oil. This pizza was a little less adventurous than the Za Za, but he reported both to be good. Pizzeria Lola is known for a great pizza crust. The creator is a certified pizzaiola, trained at the International School of Pizza in San Francisco. I liked the crust. The dough was a little bit sweet and had the charred crunch and slight chewiness I’ve come to know and love in a wood fired pizza. 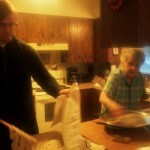 We have several strong options for pizza cooked over coal or wood fire in the Twin Cities. I’ve been to Pizza Nea, Blacksheep and Punch Neapolitan Pizza. Punch in Highland Park is in my neighborhood, I have been there the most. The meltingly thin Neapolitan wood fired crust, with San Marzano tomatoes and Mozzarella di Bufala with basil and added mushrooms is impossible to oust as my favorite wood fired pie. For me, Nea just didn’t have enough cheese, and the oddly topped, dry pizza I had at Black Sheep didn’t win my praise either. For me, Lola comes in second for pizza, but probably tops all 3 for beer selection and has a great atmosphere. And the moment you’ve all been waiting for… The Sunnyside. I first experienced a soft egg on a pizza when I was 14, visiting my cousin in Leysin, Switzerland. There, the egg was fried, sunny side up and placed in the middle of the pizza, which was topped with otherwise typical western pizzas toppings. Bjorn ordered Lola’s Sunnyside. Of all of the pizzas at Lola, I think the Sunnyside has received the most media attention and praise. 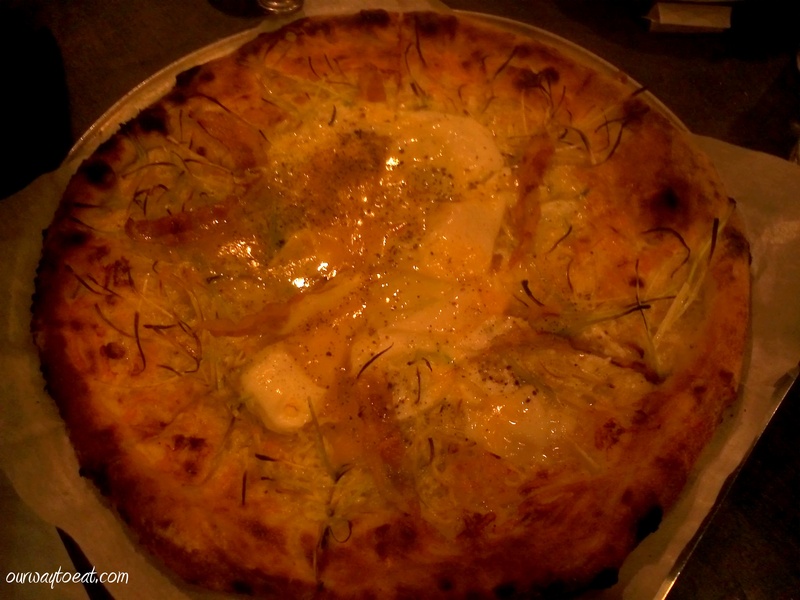 It is topped with La Quercia Guanciale, pecorino, cream, leeks and soft eggs. These days, it seems that soft eggs are everywhere served with vegetables, pastas and meat dishes. The one I think sounds the best is grilled bruschetta with soft eggs and lobster at Bar La Grassa. The warm, running egg yolk has achieved show stopper status in the food world. Let’s face it, there is something undeniably rich in the simplicity of a perfectly poached egg. I appreciate restaurants employing simple creativity, but I’m not dying to have more soft eggs in my life. What can I say? I like mozzarella, tomato and mushrooms on my pizza, and soft eggs with salt and pepper on toast. Even so, I applaud restaurants for challenging our palates and expectations by putting together unique flavors and artisanal ingredients, and so I’m glad we tried it. 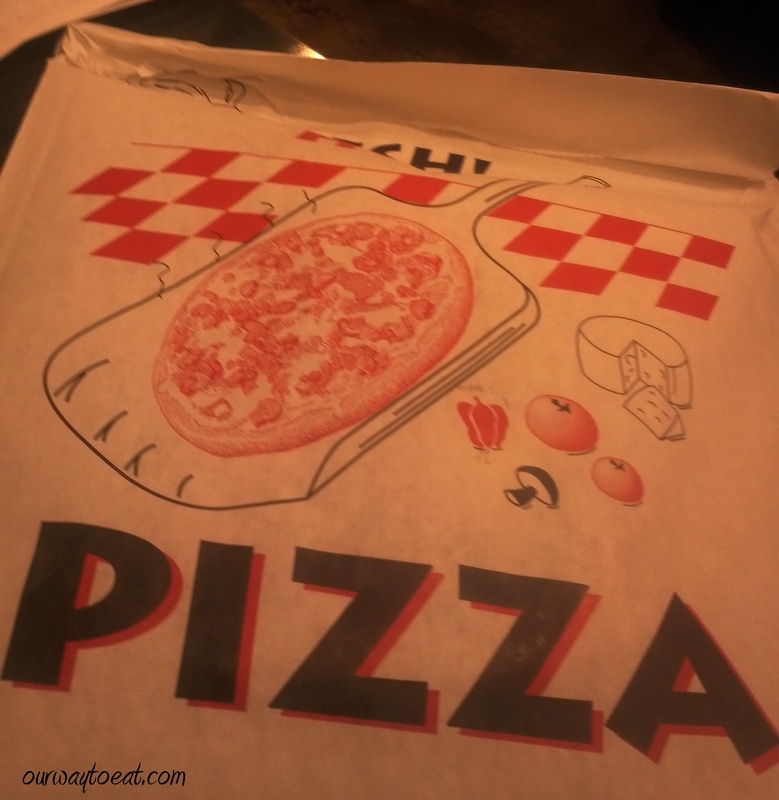 We shared our pizzas around the table, and ended up with leftovers which were wrapped for us to carry away in puffed up paper bags. 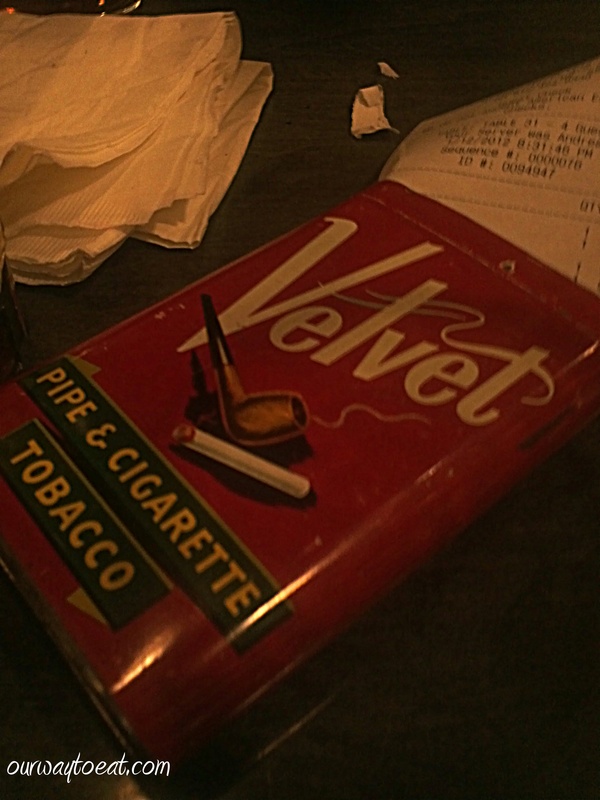 The check arrived to our table in a vintage tobacco tin. Another unique and interesting touch! I give atmosphere and presentation at Pizzeria Lola A +. 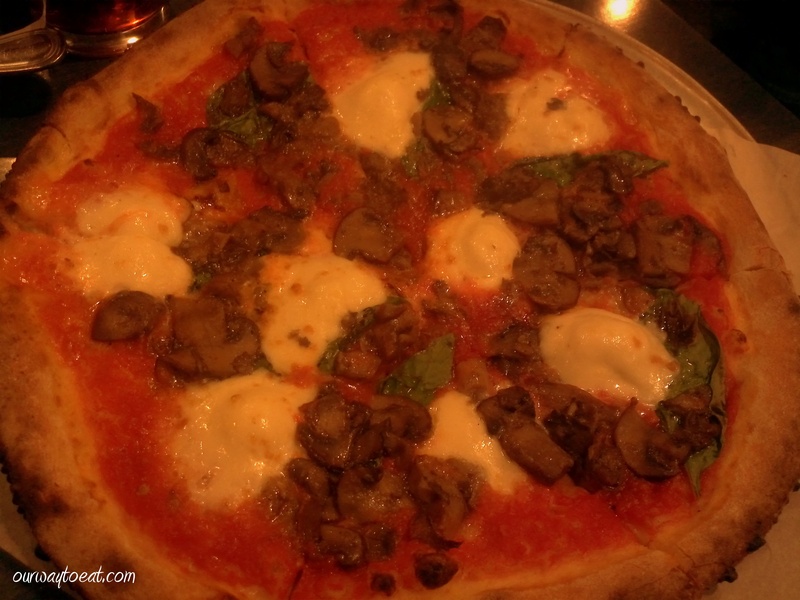 And for the pizza, I will go back and try another some day–probably when I am more in the mood for a mushroom pizza without sauce, and definitely to try the Calabrian Chili Roasted Cauliflower which sounds yummy. I bid Pizzeria Lola belated welcome to the Twin Cities. When you are feeling up for wood fired pizza with a great crust and toppings that are just a little bit off the beaten track, I encourage you to try it. *I am sorry, I cannot identify that meat. The server described the antipasto platter rather quickly, and I missed that part of the description. **I also cannot identify the cheese. It was mild in flavor, creamy and soft. I think it may have been a toscano fresco, a delicious sheep’s milk cheese from Tuscany.